You didn't start painting until rather late in life. How did that come about? Jyotish : It was a bit unusual, so I’ll tell the longer story, and maybe we can take it from there. My father and my older brother were architects, my mother was a weaver, my sister was a potter, and my younger brother teaches graphic arts. So I was born into a very creative family. I didn’t apply it to art until I started painting in my mid-fifties. I came to Ananda in my twenties, and then all my creative energy went into helping Swami Kriyananda build this work. Building a spiritual work, and starting a community from scratch required a tremendous amount of creative thought. And because I had that creative mindset from early on, I was never intimidated by the challenges. You might say that the early exposure to a creative frame of mind set the stage for what I’ve had to do at Ananda. I did a little photography, because it was something I could fit in – I could take photos for an hour, and it gave me a small creative outlet, but it was never a primary focus. Then, oddly enough, we were in the Bay Area, and we happened to meet a well-known healer. He’d been an engineer, and he’d built a machine that allowed him to dial in any wavelength of light he wanted. He would muscle-test you and come up with two or three wavelengths of colors that your body seemed to be needing, and then you could look into a chrome tube and absorb your personal colors. I’ve never been a good subject for subtle healing methods like homeopathy and so on. But when I came out of the light treatment my body felt lighter than air, and I felt like I was floating over the ground. The colors stayed with me very strongly for weeks, and I realized there was something in my system that needed color. It wanted intense color. And at first I thought that I might get a bright light bulb and some theatrical gels so that I could dial-up the colors that felt right in my meditation room. The light machine was far too expensive, and I never got around to building my own system, but there was an abiding sense that I needed more color in my life. I went shopping for art supplies, and of course I bought entirely the wrong paints – they were what you’d use to paint a wooden duck or something, and not at all suitable for what I wanted to do. But it got me started. My first attempt was terrible. Then I got hold of a book on painting and did four or five exercises, and by about the seventh or eighth painting I had one that I liked a lot, and we still have it on the wall. It was a painting of tulips, done in bright colors. It satisfied my artistic side, and I felt it was good enough to put on the wall. As I kept painting, fresh ideas would come to me in meditation. Often it would be no more than a feeling, or an energy, or a particular color. It was hardly ever a scene from the real world that I envisioned. I’m not drawn to abstract art, because it seems too ungrounded for my taste. But the feeling was very clear and specific – I had a very strong sense of a particular energy and color, and I began to think of how I could put it in a painting. The image came of Mt. Shasta erupting, reflecting the energy I had felt in the spine. The painting has bright reds and oranges, with an abstract mountain stream flowing from the crater. I called it Shasta is Born. It represents the energy that I had felt in meditation – the explosion of reds and oranges, and the mountain stream – those images came from the meditation, and I tried to use my intuition to translate it into a visual form. Many of my paintings have come from experiences in meditation. It might be a clear feeling that energizes me to express it on canvas – a mood of peace, or a feeling of aspiration, and I’ll ask, "How can I translate this spiritual quality and put it on canvas?" Your paintings are landscapes, but you’re reversing the usual process where you would see something in nature and paint it, perhaps with the hope that you could put the right feeling into it? Jyotish: Yes, but even if I were to start with a subject from nature, the painting would express a spiritual energy, or an uplifted state of consciousness. 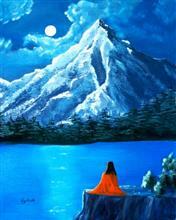 Quite a few of my paintings have Paramhansa Yogananda or Swami Kriyananda in them. About eighty percent will have Yogananda meditating with his back turned. What it’s saying is, “Don’t look at his physical body. Don’t try to form an overly personal relationship with his personality and his physical form. Try to see him as one who is fully merged in God.” As Swami said, Paramhansa Yogananda is not that physical form – he is the divine light of God. As we’re speaking, I’m looking at a painting where Master is meditating on a rock by the ocean. He’s gazing out over the ocean at the horizon, and there’s a bright orange sky in the distance, and a mottled setting sun. Master said that the dividing line between the ocean and sky symbolizes the transition between consciousness and superconsciousness. He urged us to meditate on that line, as the painting shows him doing. The inward experience of his meditation is suggested in the sky, as the beautiful golden light that we can see in the brighter central part of the spiritual eye in deep meditation. As you paint, do you explore the inspiration as you’re putting paint on the canvas? Jyotish: Definitely. When I started, I tried painting with watercolors, or a watercolor medium, or acrylic inks. But those media force you to pre-visualize the whole painting in advance, because you can’t easily paint over what you’ve done. That doesn’t work for me, because I’m looking to develop an intuitive flow, and I need to be able to shift directions as my intuition leads me. Swamiji knew that I was very logically oriented, and I needed to develop a more intuitively creative approach. He encouraged me strongly in my painting. But watercolor forces you into a planned approach that’s a bit like painting by the numbers, and it’s more rational than intuitive. I eventually moved to acrylics, which allow you to paint over and over, and oils, where it’s even more the case. If you were to scrape away my paintings, layer by layer, you would very often see how I started in a direction that didn’t pan out and I painted over it, making adjustments as I went along. I might make many adjustments, and after you’ve been painting for a while you start to get a sense for what’s working for you, and what your strengths and tendencies are. Most of my paintings have lots of color in them, because I’m trying to build bridges to the spiritual world. It may be perfectly valid for an artist to paint in grays and neutral tones, but that doesn’t hold any appeal for me. I want color, and often my colors aren’t realistic, because they’re brighter than you would see in nature. The trees tend to be a brighter orange or red or yellow. And I do it for a definite reason, because if you’re seeing the astral body of a tree, my sense is that it will be a lot brighter than its physical counterpart. We have a print of one of your paintings on a wall in our home. It shows a forest of birches, and what looks like a river of golden light going up the center and spreading out among the trees. It’s clear that you weren’t trying to recreate a physical forest. The painting looks astral and rather incomplete, yet it looks very complete in itself. When I look at it, I wonder about the process that it might have taken to create it. Jyotish: I’m pretty sure I know the painting you’re referring to. I started out wanting to do a specific kind of painting. At the far end of the avenue of birches, there’s a lighter area, and the river represents the tunnel of the spine through which the consciousness rises in deep meditation. It’s a tunnel-like experience. And if you follow the energy up the spine to the medulla at the base of the skull, and keep following the current as it bends forward from the medulla to the spiritual eye, the river of light in the painting represents the energy that’s making that journey from the base of the spine to the spiritual eye. But, again, in order to make the upward-flowing energy more defined and tunnel-like, it needed to have walls to give it direction – but not solid walls. So the birches at the sides represent a focusing of the energy – they keep the energy from drifting off and spilling over without a clear sense of direction. If you want to meditate deeply, you can’t let your energy and attention get distracted and go wandering through the birch grove. The energy has to rise up the astral spine, then it has to go straight from the medulla into the light. That’s the vibration of the painting – it’s bright yellows, with a bright golden energy that represents the inner core of the astral eye that you can see in meditation. That bright golden-yellow color is the astral energy of the spiritual eye. But if I had left it at that, it wouldn’t be grounded. If I wanted to suggest pure energy, I could have done it with an abstract painting. But the river of golden light needed rocks on either side to keep the energy moving in the right direction. The rocks are an earth element, and they ground the painting. The painting has the four elements – earth in the rocks, the water in the stream, the fiery energy of the light, and when you ascend through the tunnel and rise into the sky, you’re entering the air element. But I don’t want the trees to be fully seen. I don’t want to create an abrupt break from the astral to the physical, which would distract from the feeling of a flow. So I need trees that are half-trees and half-light, to help the rising energy transition into the light – into the inner fire of the spiritual eye – and expand into the air element that represents the superconscious state. But these are all just afterthoughts that I’m making up after the fact. In reality, I set out to paint an experience, and I’m not sure at the start which way it will go. Looking at that painting, I have the feeling that it’s about meditating in the spine. It’s a pleasure to contemplate – it gives off a harmonious feeling, and it makes me feel peaceful. And that raises a question: what role does the viewer play in your paintings? Are you trying to help people? Are you trying to inspire them to explore their own spirituality, or their creativity? Jyotish: I would say so, because it’s my nature to teach. It’s been my dharma in this life to serve as a teacher and leader, and it’s an influence that I’m not going to be able to escape when I’m painting. I’m paraphrasing, but she’s saying that it isn’t necessary to translate a painting into words. I’m talking like this to help you understand the process I go through. But I never say, “Gee, that was a really good talk. I think I’ll translate it into a painting.” Still, I would say that my paintings all have a spiritual element, or a spiritual energy. Continuing with the theme of the viewer’s role, I’ll briefly tell about a personal experience, as a way to kick off a direction for our discussion. It was during the court case, toward the end. We had some time off in December, and I took a motel room on the beach near Santa Cruz. I brought my camera with the idea that I might take some pictures. And on the first evening I decided to go to Pacific Avenue, the main drag in Santa Cruz, and see what was there, and maybe go to a bookstore and a health food store. I ended up walking up and down the street for hours, just up and down. I did that every night I was there, and I never went to the beach or took a single photo. And the reason was that everything was so beautiful. Things that I would never have seen as beautiful were radiant with beauty. The clothes that people were wearing, male and female, and objects in the store windows, and just everything. But it brings up the issue of whether it’s valuable for people to try to get into that space, where they aren’t thinking and they’re just appreciating beauty in a very deep way – whether it’s valuable psychologically or spiritually, and whether they should be encouraged to explore that side of themselves through the arts or through music, or whatever. Jyotish: I think it’s absolutely valuable both psychologically and especially spiritually, because when you’re in that state, you’re in an equivalent state to a good meditation, or maybe even a very high meditation, where you’re absorbed in something and the ego is no longer active as much as it normally is, in its usual habit of judging and liking and disliking, rejecting this or accepting that, and all those kinds of things that go on, generally speaking, at a subconscious or semi-conscious level. When you’re absolutely absorbed in things, it raises the consciousness, and in that raised consciousness you may have heightened perceptions. You might see textures more clearly, or colors more vividly, not psychedelically but more brightly, with more feeling, and you realize that the colors are there more than you might in your normal state, or especially in a depressed state. Colors and patterns will have a feeling, a very strong feeling attached to them. Jyotish: Yes, anything that uplifts the consciousness and expands it, I would say, is an innately spiritual experience, whether we label it as such or not. And I would go farther and say that any innately spiritual experience is good for a person psychologically. You mentioned that Swami encouraged you to continue with your painting. Did he share any thoughts about how the arts can help us? Jyotish: Swami didn’t say so much to me in that vein, but he wrote and spoke about it a lot. He would often talk about creativity, or the arts, in a way that made it very clear that he was encouraging us to develop that side of our consciousness. He often encouraged me to be more intuitive and less rational, and when I started to paint, I think he saw it as a way for me to keep working on being less oriented toward reason, and more flowing and intuitive, and that it would help me in other ways. It would help my speaking and leadership, it would help with organizing, and in working with people. Shifting directions slightly, Swamiji said that if Ananda’s music were to get even a little bit off in terms of how people perform it, or how it’s interpreted, that it would do a great deal of harm to Ananda, because the music basically is us. Do you have any thoughts about that, and about how important it is for people who live in the Ananda communities, or who are associated with Ananda, to be careful about the way we approach the music and the arts generally? Jyotish: If you think of the pillars of Swami’s creativity, including the tremendous creativity that he brought to his leadership and his writing and speaking, music was definitely one of the main pillars of his expression. He often said, “If you want to know me, listen to my music.” He made lots of statements about the music and its importance. “I’ve never written an insincere note.” And, “Music is a language, and I understand that language, and most people don’t understand that language.” And he definitely worked to keep the vibration of the music pure. But Swami could hear the vibrational difference between spiritually uplifting music and the folk music, or whatever it is, that people tend to be writing. (Singing), “Brother Sun and Sister Moon…” And Swami said, “That musical phrase is just perfect.” But then the next note should be (singing), “Brother Sun and Sister Moon…” And it should stay on that note. But instead it goes emotional. It goes, “I seldom see you, seldom hear your tune.” It hops over to the emotional and becomes very soupily sentimental. And Swami could immediately hear that and know what was going on. Whereas others might say, “Yes, but it’s so popular!” Or “Yes, but it’s so sweet!” – Swami knew what it was saying in terms of setting up a vibration, and how it would affect our consciousness, by engrossing us in a sentimental mood instead of raising us toward a level of self-forgetful devotion. All of Swami’s music has a very definite spiritual vibration. As he put it, “I’ve never written a single note that wasn’t inspired by Spirit.” And he knew that if people would sing the music, and especially if they would sing it together in choirs and small groups, they would be greatly helped by being immersed in that spiritual vibration. The fact is, most popular music takes us into ego consciousness, while Swamiji’s music takes us into a higher consciousness and leaves the ego behind. And then people who don’t understand what it’s doing will want to change it, or they’ll want to bring it into resonance with the patterns of their old listening habits, which are reflected in the music they grew up with. “Let’s speed it up a little – it’s too slow.” Or, “Let’s make the beat heavier.” And we’re constantly having to fight to keep the music pure. It’s one of the absolute pillars of this work, because people who sing the music and listen to the music get in tune with Spirit in a deeper way. Devi and I hardly ever play any other music. We don’t sing much, because we’ve had to choose where we can put our energy. But we’ll often have music playing, and it’s hardly ever anything but Swami’s music, because it feels so right, spiritually and vibrationally. Jyotish: (laughs) I remember a movie about Beethoven’s life that we saw many years ago. This was when Kalyani and her son Prem were living at Ananda Village. Prem was seven or eight, and in the movie a guy walked into a scene, a German fellow with a big, beautiful baritone voice, and sang part of the “Ode to Joy.” He sang it beautifully, but very much in the awareness that he was the great artist. And Prem piped up and said, “Mommy, is he winning?” Because he could feel the ego in the expression, as opposed to the purity of the music itself. 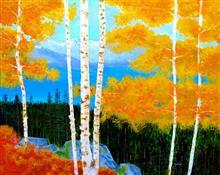 Do you have a website where your paintings are available? Jyotish: Yes, it’s JyotishArt.com. Or you can visit JyotishandDevi.org and a link will take you to the art. These paintings are for anybody to use in any non-commercial way.